Space is big enough for everyone and it is in everyone’s best interest to keep it free for exploration and use by all. This is part 1 of a two-part series that outlines a conceptual framework characterizing the dynamics that contribute to instability and stability in the space domain. Part 2 will examine the ways and means the United States can lessen the former and strengthen the latter while maintaining space preeminence into the 21st century. Both parts are follow-on articles to a previously published piece on policy considerations for a deeper and more balanced U.S. space posture. Many Americans view space through the prisms of history, entertainment, and exploration. Our parents grew up during the space race between the United States and the former Soviet Union, culminating in Neil Armstrong’s historic landing on the moon. We spent our youth watching popular movies and shows like Star Wars and Star Trek, while witnessing the realization of science fiction into science fact in the forms of the Space Shuttle, International Space Station, and unmanned interplanetary space travel. Our children may be the first space tourists, traveling to the heavens in commercial space vehicles. Our grandchildren may become the first space colonists, living in space and on the moon, an asteroid, or perhaps Mars. Our great grandchildren may even become the first interstellar space explorers, venturing beyond our solar system and possibly to the stars. Yet despite this popular conception of space, very few Americans know, understand, and appreciate the stark reality that we now live in a world where “space systems allow people and governments around the world to see with clarity, communicate with certainty, navigate with accuracy, and operate with assurance.” Space must be understood as a global commons – much like airspace, the oceans, and perhaps even cyberspace – where secure access and established norms ensure economic growth and political stability. Indeed, the rapid growth and development of the global economy has heralded a new era where an ever-increasing number of nations and organizations use space for military, economic, commercial, and scientific benefits – making it more “congested, contested, and competitive.” The now pervasive and interconnected nature of space capabilities and the world’s growing dependence on them also mean that “irresponsible acts” in space can have worldwide, indiscriminate, and damaging consequences on earth. Therefore, space preeminence is that degree of preeminence in space of one force over another that permits the conduct of operations by the former at a given time and place without prohibitive interference by the opposing force (freedom of action). Such a preeminent position does not imply space dominance, a far more demanding position that would be difficult to sustain in any event, given globalized technology growth and offsetting space countermeasures. Many space observers and pundits believe that within the next 5-10 years the evolving space environment may become increasingly destabilized due to the continued development, deployment, and proliferation of offensive counter-space (OCS) capabilities by various nations and perhaps some organizations. The unique dynamics of competition and cooperation in space must be thoroughly understood in order to shape a sustainable future in this domain that will be so critical to humanity’s future. Instability arises when there is a real or perceived lack of order and security with the worst possible outcome being the “Thucydides Trap” – a rising power opposes a dominant power leading to great-power competition for space preeminence. The principal drivers of space instability include (but are not limited to) competing space powers, space-terrestrial preeminence linkage, the offensive-inclined nature of space warfare, and destabilizing partnerships. Competing Space Powers. The United States is the preeminent space power, and enjoys unprecedented and unrivaled national security advantages derived from its space capabilities. Other space powers have taken notice with some potential competitors (and possible future adversaries) developing significant capabilities to erode the U.S. strategic advantage in space and protect their own growing reliance on space capabilities. According to the 2015 United States-China Economic and Security Review Commission’s Report to Congress, Chinese military leaders regard the freedom to use space-based systems and deny the adversary access to space-based systems as central to enabling modern informationized warfare. Space-Terrestrial Preeminence Linkage. Potential competitors are also acutely aware of U.S. terrestrial preeminence enabled by space preeminence, and see an opportunity to undercut the former through the latter. 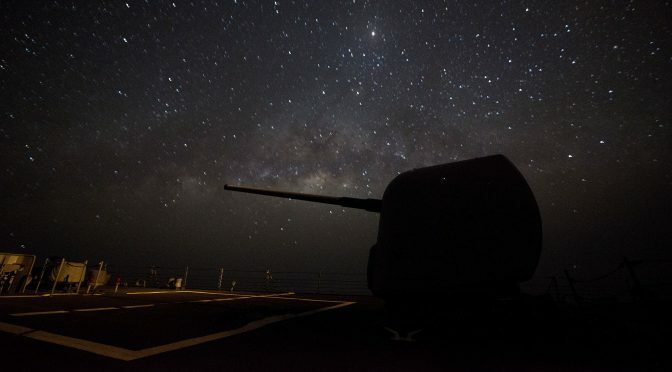 Of particular concern is a rising China, who appears to be asymmetrically targeting American dominant warfighting capabilities and exposed dependency on space assets. This is problematic for the United States who has more vulnerable high-value space assets and is more reliant on space capabilities than the other space powers. America has a disproportionate amount of vulnerable high-value space assets. Of the 1419 active satellites orbiting the earth, 576 are owned or affiliated with the United States. The next closest competitors are China (181) and Russia (140) with the former increasing rapidly in terms of quantity, quality, sophistication, and capability. America is also disproportionately dependent on space capabilities with its 278 government- or military-operated satellites, providing unmatched national security advantages in worldwide situational awareness, decision superiority, and military capability. 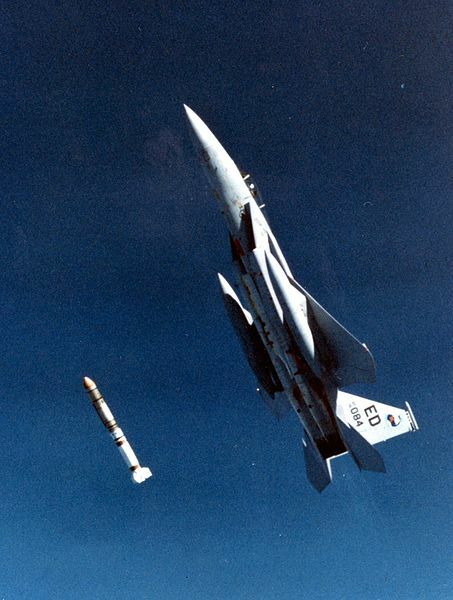 Therefore, U.S. deterrent or response actions limited to just the space domain where the stronger power has more to lose than a weaker power may not be practical, sustainable, or even desirable. Offense-Inclined Nature of Space Warfare. “A space power that strikes aggressively should, in theory, have the advantage, or at least get the greatest possible use of whatever OCS capabilities it has invested in.” Ambiguous indications and warning, attack attribution, and battle damage assessment; uncertain resiliency and assured retaliation; and vulnerability, predictability, and fragility of space assets give the operational and tactical advantages to the attacker and increase the strategic temptation to attack. All in all, OCS capabilities are attractive options for a weaker power because they offer asymmetric means to undermine the terrestrial preeminence of a stronger power by exploiting its reliance on critically-enabling space capabilities. Destabilizing Partnerships. Exclusive enterprises can be perceived by excluded parties as indirect efforts to isolate and undermine them. Look how Beijing perceives Washington’s rebalance to the Indo-Asia-Pacific, Trans-Pacific Partnership, and efforts to strengthen and expand the principled network of economic and security relationships as part of the greater U.S. containment policy of China’s rise, and to a certain extent, justification for its regional assertive actions and validation of its sense of aggrieved historical victimhood (strategic narratives). Stability arises when there is a real or perceived sense of order and security with the best possible outcome being the universal acceptance that space is big enough for everyone and it is in everyone’s best interest to keep it free for exploration and use by all. The principal drivers of space stability include (but are not limited to) stabilizing partnerships, common space dangers, space deterrence, and space governance. Stabilizing Partnerships. The ubiquitous benefits of space affect the everyday lives of people around the world. Hence, multi-national corporations are collaborating more and more in space. They see vast business opportunities for shared profits and shared costs in the lucrative areas of space situational awareness, scientific exploration, commercial ventures, and space tourism. In the geopolitical realm, inclusive enterprises share risk and promote mutual trust and cooperation amongst the parties involved. If all share the same risk, then a space attack on one is a space attack on all. Common Space Dangers. There are over 60 nations and government consortia that own and operate satellites. All of whom share the same domain; common interest of stability, security, and sustainability; and desire for free access to and use of space for all. Space debris accumulated over six decades of space activities impacts current and threatens future space operations and activities. The U.S. Department of Defense tracks approximately 22,000 “man-made” objects in addition to the 1419 active satellites. Nonetheless, there may be as many as hundreds of thousands of additional pieces of debris that are too small to track with current sensors. There is also an increasing global awareness of potential catastrophic space threats (asteroid, solar events, cosmic radiation, etc.) and a growing interest for global contingency planning and preparedness. Space Deterrence (Keeping the Peace). Many space strategists view deterrence through the doctrinal lens of imposing costs, denying benefits, and encouraging restraint to deter or make an adversary believe that starting a war or escalating a conflict would be worse than not doing so. Imposing Costs. OCS capabilities are necessary at some level to enable deterrence and retaliation if deterrence fails, unless space assets can be given far greater resilient capabilities than the little they have today. Moreover, OCS capabilities like nuclear and cyber (and developing hypersonic) weapons are now permanent fixtures of the strategic arsenal. In other words, the genie is out of the bottle. Those who possess OCS capabilities are unlikely to surrender them. Those who do not have OCS capabilities will try to acquire them, while those who do have OCS capabilities will try to prevent others from getting them. Denying Benefits. Resilient space architecture “may” be able (in varying degree) to blunt the effectiveness of OCS capabilities; offset the offense-inclined nature of space warfare by lessening the vulnerability and fragility of space assets; reduce the temptation for a first strike; and assure a second strike capability. Encouraging Restraint. Uncertain consequences in terms of second- and third-order effects and uncontrolled escalation may give pause to the attacker and possibly decrease the temptation to attack. A space attack can inadvertently impact the attacker as well in terms of degraded or lost global services, space debris, political costs, and indirect economic costs. Space Governance (Managing the Peace). An extant body of international agreements (treaties) and legal principles forms a framework of accepted norms of behavior for the space domain. However, more diplomatic and legal conventions are still needed to manage the constantly evolving strategic, operational, and tactical landscapes in space; and enhance the space stability thereof – particularly in the areas of space debris, space traffic regulation, resource exploitation, OCS capabilities, arms control, and arms reduction. This concludes the short discourse on the dynamics of space instability and stability; and sets the conditions for further discussion in Part 2 on the ways and means the United States can employ to reduce instability and strengthen stability in the space domain while maintaining space preeminence into the new century. Decline is a deliberate choice, not an inevitable reality. Tuan N. Pham has extensive and diverse experience in national security affairs. The views expressed are his own and do not reflect the official policy or position of the U.S. Government.